The Special Operations Division was led during 2018 by Division Chief Fiona Dunleavy and Assistant Chief Anthony Campagna. The division investigates cases involving misuse of public funds, political corruption, hate crimes, threats and other crimes impacting the integrity of the justice system such as perjury and filing of falsified documents, and criminal misconduct of government officials, including peace officers and other public employees. 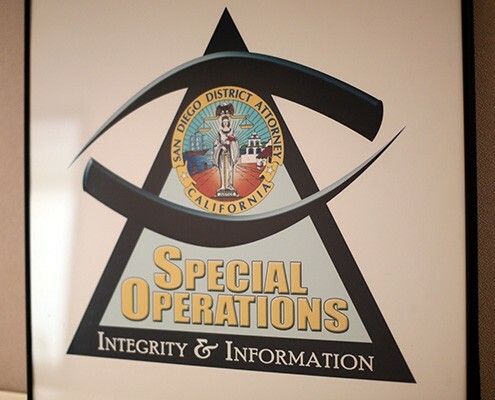 In all, the division had 316 open investigations in 2018. The Special Operations Division also reviews officer-involved shootings and in-custody deaths. The Office of the District Attorney has conducted reviews of all officer-involved shootings (OIS) in the line of duty by San Diego County peace officers since the mid-1970s. The purpose of the District Attorney’s review is to provide an independent review of all shootings and other use of deadly force, fatal and non-fatal, to assure the public that peace officers in San Diego County are performing their duties in a legally justified manner. If the peace officer’s actions were determined to be legally justifiable, a letter summarizing the facts and statements of the deputy or officer and other witnesses is written and delivered to the respective police chief or San Diego County Sheriff. During 2018, the division completed reviews of 10 officer-involved shootings and nine in-custody deaths. In 2016, the Chiefs of Police, Sheriff and District Attorney implemented a new policy on how public release of law enforcement video obtained during an officer-involved shooting would occur. During 2018 the District Attorney released video in six officer-involved shooting cases dating back to August, 2017. In 2018, the chiefs of police, Sheriff and District Attorney amended the policy to include release of law enforcement video obtained where a person dies while in the custody of law enforcement. During 2018 the District Attorney released video in seven of these cases dating back to February, 2018. The Firearms Compliance Team (FACT) investigates and prosecutes persons who attempt to purchase or acquire firearms but are legally prohibited from doing so. Prohibited persons include felons, persons subject to a restraining order, persons with certain misdemeanor convictions, such as domestic violence, or persons who have been previously committed to a mental health institution. A prosecutor and investigator are assigned to FACT cases throughout the county. In 2018 they reviewed 160 cases. 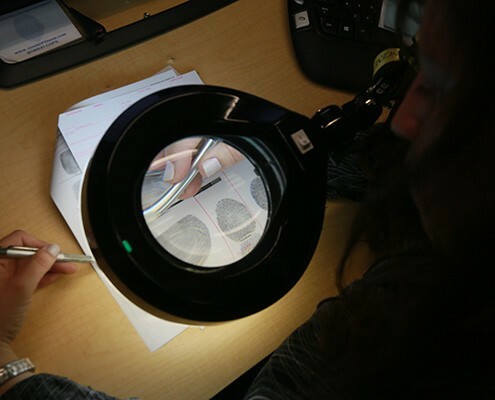 The Background Unit handles all in-house investigations including background checks for potential employees. Last year, the unit performed 319 background checks. In addition, the division has international liaisons who assist with cases in other District Attorney divisions or branches. An executive assistant to a city manager in San Diego County purchased iPads and iPhones with her city credit card and then sold them on eBay. The amount charged to the credit card was stipulated to be $25,000. The assistant pleaded guilty to felony grand theft, was placed on probation and ordered to pay restitution. The Firearms Compliance Team continued to investigate and prosecute persons who are prohibited from purchasing or owning firearms. The majority of persons who were prosecuted had prior mental health commitments, felony convictions, or restraining orders against them. One such example was a person who had a domestic violence restraining order from another state. That person was found in possession of two rifles and 500 rounds of ammunition. The defendant pled guilty to possession of ammunition by a prohibited person, a felony, and violation of a restraining order, a misdemeanor. A convicted felon was found in possession of three firearms, 100 ammunition magazines and 30,000 rounds of ammunition, a collapsible baton and two trigger mechanisms. The defendant pled guilty to being a felon in possession of a firearm. In 2018 our office reviewed 51 hate crimes compared to 25 in 2017. In 2018, 30 resulted in prosecutions compared to 13 in 2017. Hate crimes negatively affect entire communities because they often target an entire group of people, resulting in uneasiness in the community. Our assigned Deputy District Attorney works with various community organizations to present anti-bias education for students and educators in our local schools. In 2018 the Special Operations Division filed two criminal cases against peace officers. Those cases are still pending.